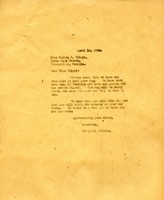 Mrs. Broyles pays her bill and adds that she was delighted with the rugs. 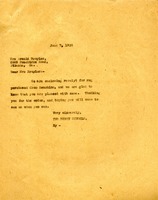 The Berry Schools write to Mrs. Bridges to inform her that they do not take orders for rugs with the customer furnishing the materials. 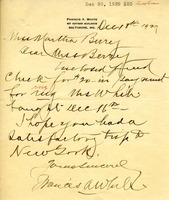 White sends a $20 check in payment for a rug, and hopes that Martha Berry had a nice trip to New York. 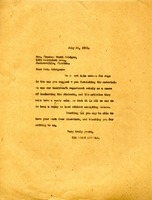 Mrs. Rourke writes to inform Miss Berry that she has sent a box of clothing and rug making materials and to express her desire to visit someday. Martha Berry lets Miss Lovejoy know that they will take her order, but it will be delayed. 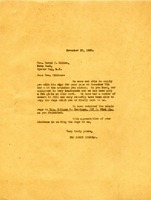 The Berry Schools writes to Miss Wilmot apologizing for not having sent her rug to her as they have been busy, but they explain that it will be ready in the next few days. They hope that she will visit the schools on her way North. 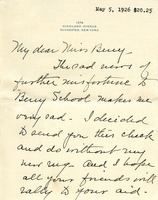 This letter describes how the rugs they ordered for the Berry Schools were no longer needed and they will be returned. 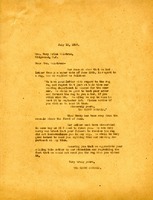 The Berry Schools write to Mary to inform her that it appears the mail failed to carry the rug that she had ordered. Walstrum does not understand why her letters about a rug order have gone unanswered. 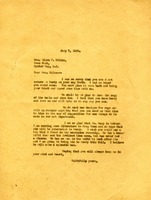 Mrs. Walker expresses her sadness about the burned dormitory and includes a check, saying that she can do without her new rug. She hopes that Berry's other friends will send checks as well and the building will be finished in time. Mrs. Nash sends $2 to purchase a rug from the Berry Schools. 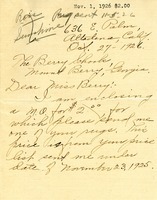 She also asks for a sample of Miss Berry's work to be sent to her for her studio. 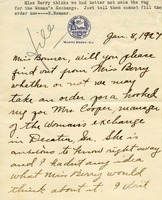 In a subsequent letter, Martha Berry sends a receipt for the rug and encloses the article to be sent to Mrs. Nash.